February 1987 at the Sol Studio, Cookham, Berkshire. Mixed at the Sol Studio, Cookham, Berkshire. 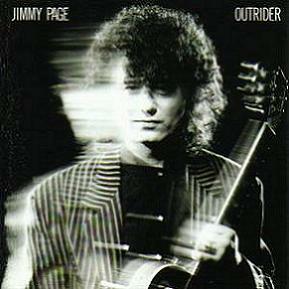 Outrider is an album by Jimmy Page, released by Geffen Records on 19 June 1988. It is his first solo album, and the first time since 1969 he recorded with another label other than Atlantic Records/Swan Song Records. It was recorded at the Sol, Page's personal studio. Robert Plant guests on one track, 'The Only One', while John Bonham's son Jason drums with Page for the first time on record. This was originally intended to be a two album release. However, during the early recording stages of this album, Page's house was broken into and amongst the items stolen were the demo tapes which had been recorded up to that point. The album reached #26 on Billboard's Billboard 200 chart, also peaking at #27 on the UK Album Chart. Three of the stolen tracks later showed up on a bootleg recording - 'Judas Touch', 'Muddy Water Blues' and an updated cover of 'Train Kept A-Rollin. ↑ Lewis, Dave and Pallett, Simon (1997) Led Zeppelin: The Concert File, London: Omnibus Press, p. 166. ↑ 'I first met Jimmy on Tolworth Broadway, holding a bag of exotic fish...', Uncut, January 2009, p. 47. ↑ Kerrang! Albums of 1988. rocklistmusic.co.uk. Retrieved on 2009-01-19. ↑ Top 100 Albums - 2 July 1988. chartstats.com. Retrieved on 2009-01-19. ↑ Top 60 Albums - 6 July 1988. swedishcharts.com. Retrieved on 2009-01-17. ↑ The Billboard 200 - 30 July 1988. Billboard. Retrieved on 2009-01-17. ↑ RPM Albums Chart - 6 August 1988. RPM. Retrieved on 2009-01-17. ↑ Top 50 Albums - 7 August 1988. ARIA. Retrieved on 2009-01-17. ↑ Top 100 Albums - August 1988. charts-surfer.de. Retrieved on 2009-01-19. ↑ Hot Mainstream Rock Tracks - 9 July 1988. Billboard. Retrieved on 2009-01-15. ↑ RPM Singles Chart - 27 August 1988. RPM. Retrieved on 2009-01-15. ↑ Hot Mainstream Rock Tracks - 20 August 1988. Billboard. Retrieved on 2009-01-15. ↑ Hot Mainstream Rock Tracks - 8 October 1988. Billboard. Retrieved on 2009-01-15. ↑ RIAA.org Outrider - 23 August 1988. RIAA. Retrieved on 2009-01-19. This page was last modified 13:52, 2 January 2014.